You are currently browsing the category archive for the ‘First Time Marathon Training’ category. In six days I will ride the beast. That’s what a friend of mine calls running a marathon: riding the beast. It encourages me in a do-or-die sort of way. I am not sure how I got here. I know training was involved. I know it began when there were still patches of snow on the ground. Yet, as I review all that’s happened, it’s hard to believe I was the main character. If not for the muscles on my body, where no muscles had been before, it would be easy for me to think this was all just a book I read. The blonde runner is as vivid a character as Jo March or Elizabeth Bennet. I can picture the runner, her blonde hair tamed by a headband, choosing the roller coaster route, passing a man, being chased by a woman, Guten Morgen-ing the Nordic walker (twice), dodging manure trucks, avoiding tractors, waving to farmers, running past fields of yellow, green, gold; following, and overtaking, Pink Shirt Lady at Rothenburg; wearing her SuperSuit, mittens, rain jacket, tank top, sun hat; making war and peace with the treadmill; trotting with various assorted children on bikes, gliding joyfully beside her prodigal brother; but mostly running alone, with only her thoughts, prayers, and imagination as companions. I can picture the group of deer, startled from tranquility, bounding across the hills. Large, brown rabbits sit up and watch bemused as the woman runs by. A flock of crows mocks her. A lone bird hovers high above the sugar beet field and chirps like a car alarm until she passes. Cows stare as she disturbs the music of their belled collars by dashing through their alpine haven. The blonde runner laughs at the ducks by the Main River and admires the swans. At the Brombachsee, an elderly man smiles and salutes, just as she feels like stopping. She forces her grimace into a grin at mile 15, so her children won’t see her in pain as she finishes. I envision her legs dangling from the exam table as hope is revived with a simple roll of tape. 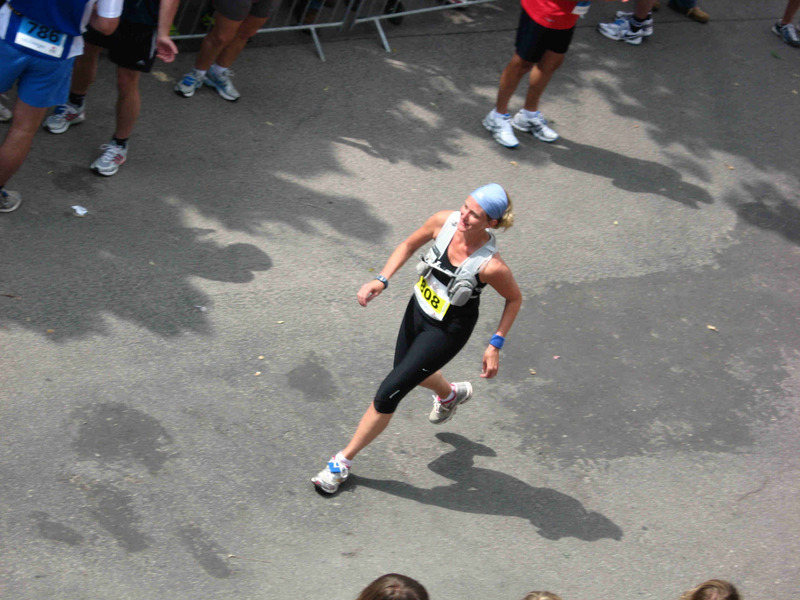 I can see this woman, this blonde runner, and all she has done, but I can’t quite believe it was me. I don’t know how I will feel when the marathon is over, and the celebration, like the training, is placed on a shelf of dusty memories. I may be happy pulling it down for the occasional re-telling. Or, this marathon could be a new storyline in this character-driven series. Denethor looks out over the plain of Pelennor and sees an overwhelming mass of enemies approaching the white city. When the attack begins, he commands his men to abandon their posts, to flee for their lives. At this point, the wizard Gandalf smacks Denethor in the head, and leads the men to defend Minas Tirith. The pain in my knee, plus a million stresses from daily life, had formed battle lines outside the gates, and when under siege, I fled. I didn’t quit running, but I did flee mentally. Before going on vacation, I managed to do an 18 mile run. I planned to write a victorious blog about it, but that would have been pure fiction. It was an ugly 18 miles. I had to stop, stretch, and even walk. It was not glorious. It was humbling. However, yesterday I was smacked in the head by a Gandalf guised as a physical therapist. This wise and good person showed me ways to improve muscle strength, so that my kneecaps will track properly. That is the long-term fix. Towards the end of the session, she looked at me and stated (though it was in question form), “You’re still going to do the marathon anyway, right?” The question had been floating around in my head, but the answer had never clearly taken shape. Fortunately, this was on an army post, where even the babies are born tough. Then she strapped my kneecaps into place with tape. I went home and did nine miles on the treadmill with no pain. When the armies of Mordor were defeated, I cried. Hope is not gone after all. Miles: After my 18 mile run, I took six days off. However, I have run 45 miles since my last post. I ran some glorious trails while on vacation, though I walked up hills, and hobbled at the end. Weather: it has gotten hotter here recently, which means I have to either run early in the morning, or on the treadmill. I’m SO glad the marathon begins at 7:30 in the morning. July can actually feel like July here. Wildlife: I didn’t know it (though I hopped over much evidence) that in Austria I was running through cow pastures. I heard their bells before I saw them. If I ever own a cow, I’m putting a big leather collar with a bell around its neck. A beautiful setting for a run. I have the perfect melancholy disposition to be a great author. If I did not have a husband, children, or God, I could perfectly imagine myself drinking too much coffee by day, drinking too much wine by night, and spewing forth a constant stream of cigarette smoke as I created dreary literary masterpieces. The most I can muster is pummeling myself with introspection. When my world is sunny, I am the best athlete the world has ever seen. When there are clouds, I am an average nobody, pretending to do something great. I have been marathon training since March, and now my knee is giving me trouble. With only 4 weeks left before race day, there might be time to heal and still complete the marathon. I can either give in to the overwhelming sense that everything I try will fail, or I can fight my way out and hope for the best. Fighting, in this case, includes cutting back mileage. I have to add strength training and more stretching. It will be difficult, and time-consuming, but it has to be done if I want to run the marathon. Normally when I’m in the doldrums, I don’t blog. I don’t like throwing pebbles into the glassy surface people think is my life. I also like to keep the blog solely about running, and leave my moods out of it. But running cannot be compartmentalized. When I am feeling down, my running is affected; and when I fail to meet my running goals, my life is somehow tainted. No matter how pleasant it may seem at times, life is unrelenting. It is a kitchen, constantly in need of cleaning, lest the mold build up in the dark places. I struggle to keep up with it. I should be running 18 miles now on my long runs. I’ve barely completed 15, which makes me seriously wonder why I’m doing all this. It would be so very easy to give up. I’m sure I could psychoanalyze the reasons why I want to train for and complete the marathon, but it is enough to say, this crazy race is a challenge I face, and I desperately want to make the cut. I am not strong, brave, or faithful. I cannot create these qualities through running, no matter how many miles I log. My wretched shell can only be filled with strength, courage, and faithfulness if God wills it. My prayer is He gives me enough to complete the 26.2 miles in July. Miles Projected: I have no idea. I’m balancing on the narrow ridgeline of panic. Failures: My 12 miles on Saturday was supposed to be 18. But my knee was hurting badly, and it was extremely hot outside (both great excuses to quit). It was a bad idea to run and was probably more mentally damaging than anything. Successes: I am determined to do an 18-miler this week. My permanent medical record clearly states something I have suspected for years: Mrs. Keri S. Wellman has fat thighs. The doctor was not quite that blunt. However, the diagnosis of Patellofemoral Pain Syndrome basically means I need to replace the flab on my thighs with actual muscle. I’m in unmapped territory here. About mile eleven on Sunday, my right knee began to ache. I stopped and stretched. By mile twelve I was popping Ibuprofen. I walked a good portion of mile thirteen. During mile fourteen, I tried willing myself into an out-of-body experience. It was mentally counter-productive, since the Grim Reaper, who is often involved in such things, is not the most inspirational running companion. I was elated to reach mile fifteen without the help of paramedics. Ten minutes after my run, my knee felt fine. It occurred to me that perhaps subconsciously I was creating pain as an excuse to not perform well. Because as we all know, when you are slow, it is better to be hobbled than lazy. The doctor assured me I’m not that psychotic. I’m just flabby. So, it’s time for some strength training for me. I also foresee many squats in my future, which do not include picking up stray M&Ms from the floor. This could be my chance to change history: medical history, that is. The next four weeks will be a battle between Lazy Keri and Someother Keri. Lazy Keri may not come out of this alive. Frankly, it’s hard to do away with someone I’ve been so comfortable with for so many years. Yet, the fact remains: Lazy Keri cannot successfully train for a marathon. Someother Keri must take her place. I just hope she’s strong enough to win. Miles projected: the goal is to have an 18 mile run this weekend. I’ll keep the rescue team on speed dial. Weather: it was perfect for my long run on Sunday: cool, and overcast with sprinkles. It amazes me whenever I call that type of weather “perfect.” The forecast is for sunshine & warmth—70s & 80s. Terrain: for the 15 miler, I went all the way around a big lake we have here in Franconia. It was partly forested, had a moments of elevation, and lovely little beaches. The path changed from pavement to rock at times. It also split off between pedestrians and bicycles, so there was no fear of being run over. A fantastic running trail. Wildlife: the usual deer, rabbits, and birds. However, the Brombachsee trail had areas containing wild boar. These big, fuzzy pigs were begging food from passersby at the fence. The way to a woman’s heart is through her running gear. Maybe that’s an oversimplification, but it’s pretty darn close. My heart fluttered. After sixteen years of marriage, the spark is still alive. My husband was calling from a huge, American-style shopping mall on one of the military installations a few hours from here. When you have lived in Germany for four years, you come to appreciate the very places you consider the bane of American culture. Not only did my husband pick up three running outfits, the perfect hat, and the perfect socks; he also found the Oakleys I’ve had in my shopping cart for three weeks on Altrec.com. There was only one pair left in white–the shop clerk had to get them from the back. I should make this clear: love cannot be purchased. Nor can it be returned with the receipt, even if in the original packaging. Love is patient. Love is kind. But love is also a man who will buy coral-colored running shorts for his wife. That is love in action. I went for a six-mile run today geared up like a superstar. No doubt, the village children will soon be asking me to demonstrate my Nathan hydration pack. My landlady will nod in approval as she notes my “Supernova” running shirt (as Germans know Adidas is superior to Nike). I’ll look at all of them sweetly through my Oakley Flak Jacket XLJs and smile as I scrawl my autograph on a PowerBar Gel pack. Or, maybe they’ll stare at me as if I should be institutionalized. While the new running gear makes me feel like an elite athlete, rather than a middle-aged housewife, I am happier knowing my husband and children support this endeavor. After all, if they weren’t behind me, I would trip over the starting line. Miles forecast: 16 on Sunday, heaven help me. Weather: rain. sun. rain. it’s still too cool to be summer. One minute people are cheering for you as you cross the finish line, the next you are joke fodder for farmers. It is back to the world of dirt and mops and scrubby brushes. It is back to being teacher, nurse, cook, diplomat, judge, jury, and cleaning lady. It is back to carving out time for training. Yet, no matter how weary I get hearing cries of “Mama!” while I’m in the bathroom, I wouldn’t trade this life for any of the glitz, glam, or bling of this world. Life is not always a breezy downhill slope. Sometimes you fight against the wind. It takes patience to wait for a six year-old to tie her shoes when you should be on the road already. It takes a calm mom to hear all sides of a story. It takes an energetic mom to clean the house. Running helps me achieve these things. Because of the half-marathon, I have learned by simply shifting my weight forward a bit, I can run faster and more efficiently. It is a little harder, but the more I run this way, the easier it will become. After all, maintaining comfort is not always best. Taking chances, working hard, and striving towards a higher goal may lead to something greater than you could imagine. If you want more energy, then run when you’re tired. If you want to be patient and calm, then run when you’re stressed. If you feel hemmed in on all sides, then run alone. If you feel alone, then run, and talk to God about it. “Oh, Keri, you are crazy!” exclaimed my landlady, as I reached the house after Tuesday’s run. Maybe I am. But then again, maybe there is method in it. Running is not about trophies or accolades or even about earning the respect of farmers: it is about clawing your way out of your comfortable box and seeing what kind of “you” emerges. To not run would be madness. Weather: Tuesday it was cool & cloudy when I began and hot & sunny when I finished. Today was long-sleeved shirt weather with winds that tried to keep me from returning home. Music: because the wind prevented my normal appreciation of nature sounds, Superchick, Casting Crowns, and Jack Johnson were my companions today. Wildlife: a few out of control birds, one rabbit, a beleaguered butterfly, and two tractors. If it weren’t for my impaired mobility this morning, I would not believe I ran a half-marathon yesterday. I have photographic evidence of the race. I have personal, eyewitness accounts, yet it all seems dreamlike to me. I ran 13 miles yesterday—at Rothenburg: a course so challenging, they had an ambulance stationed on each hilltop. I’ve never been an athlete. I have ten pounds I can’t seem to get rid of at any price. And though gummi bears are fat free, they don’t qualify as health food. I have kids and a husband and a dog. I have laundry to do and floors to wash. If I can run a race of 13 miles, it’s possible for anyone. Sitting here trying to stretch my legs while typing gives me time to reflect on yesterday’s race (if indeed that was me running). *Though drinking coffee is NEVER a wrong thing to do, I also should have done a short warm-up run before the race. Instead, I had a carafe of coffee while the kids ate ice cream. * At about mile 7, one of the runners made the mistake of asking where I was from. This began a 1 mile, one-sided conversation, where I blabbered to kill some time. And time I did kill, for my pace slowed down to a 12 minute mile. Finally the guy said, “I need to go faster now.” Oops. (For the record, I picked up the pace and ended up beating him). *Bring headphones. The last mile included a long, uphill slope, straight from Twilight Zone, that seemed to never end. A little Superchick would’ve helped. *Going downhill is easier than going uphill—use it to your advantage. *Focus. At times, I felt simply mindless. I wasn’t thinking about anything in particular, though I do remember staring at some ponies. More focus on the actual running might have helped. *Shoe laces. The shoe with my timing chip came untied at the start. Because I had to stop, I was left behind by the quick-paced pack. *Holding back. I was so worried about not having enough energy left at the end of the race that I held back in moments when I should have pressed on. *My Nathan Hydration pack was a lifesaver. I tried drinking the lukewarm mineral water at the water station but ended up splashing it all over my face. *PowerBar Refuel Gel packs helped me to keep going when I felt like giving up. *My shoes and socks were perfect! No foot aches at all. *Positive attitude. With few women entered in the race (and most of them younger and belonging to racing teams), I knew I would not be getting any trophies. However, I opted to be the friendliest runner of the day. While my fellow runners didn’t seem to appreciate my congeniality, the spectators who waited along the road were awesome. Each one of them deserved (and received) a smile, a wave, or a ‘danke’ from me. The little kids, I applauded. It was fantastic that people would sit out (for two hours or more) just to watch the runners. I loved it. *Cheerleaders. It was such a boost to see my friends & family along the route. They waved & cheered & took funny pictures of me. Even though the other runners were uber-serious, I had people who loved me, rooting for me. *Training. Even though I slacked off during vacation, I can tell my training has paid off. Many times during the race, Pink Shirt Lady was ahead of me (she was faster than she looked). However, she was breathing really hard, whereas I was able to cheerily converse with her. I ran with her for a while, and then passed her on the hilly side of the course. *Best of all was having the kids run the final stretch with me. It was worth all the effort just for the photo finish. The Rothenburger Halbmarathon was a success for me. I kept a good pace (despite hills that could send people into cardiac arrest), I kept a good attitude, and I did not finish last. Weather: partly sunny in the 60s, a few sprinkles at the end—perfect running weather. Overall feeling: if I can conquer Rothenburg, I can conquer anything. The next time I suggest marathon training easily coexists with real life, please fill my inbox with tersely worded, confrontational letters to the contrary. Last week I ran 15 miles total. I was supposed to run 27. What happened? I discovered I can get up at 5am and run before anyone knows I’m gone as long as the sun is shining. But when the irises are being pelted with rain, and my knee aches, and the sun feels every inch of 93 million miles away from the earth, I’m likely to stay in bed until I smell coffee brewing. On Saturday, the sun streamed in through the window, alerting the overzealous budgie, whose cheerful morning song reminds one of a malfunctioning fire alarm. I ran my errands early and then went down to the trail by the river. During the four days I had not been running, my joints and muscles had formed a workers’ union. Saturday was their first official strike. Despite the silent protest, I went on with business as usual. At mile five, I put on my headphones. I couldn’t let Superchick down. At mile eight, the music ended, and the trail merged with a side road. As I looked both ways before crossing to the path, I saw behind me, a woman in a fluorescent yellow shirt. The shirt was piped in white and black and had words etched across the front. The woman had spiky black hair and a scowl on her face. And she wanted to catch me. It didn’t matter if my knee hurt, or if my joints ached, or if my fingers were growing as thick as bratwursts, I would not, could not let her pass me. I didn’t have time to mess with the headphones. But now that the music had ended, I could hear her footsteps behind me. Soon I was running a nine-minute mile. Garmin tracked the mileage. ¼ mile. ½ mile. I thought ¾ mile would never come. The sound of footsteps roared in my ears like thunder. Finally, my watch beeped to signal mile nine. I turned around. She was still 100 meters away. I had won! I casually checked my watch then smiled at her. Surprise flickered across her face, which quickly reformed into a scowl. I headed towards the parking lot. To my relief, she didn’t follow me. She didn’t smile either. If my body screamed during mile eight, I didn’t hear it. If it complained at all during mile nine, I don’t remember. The sun was shining, and I had won. 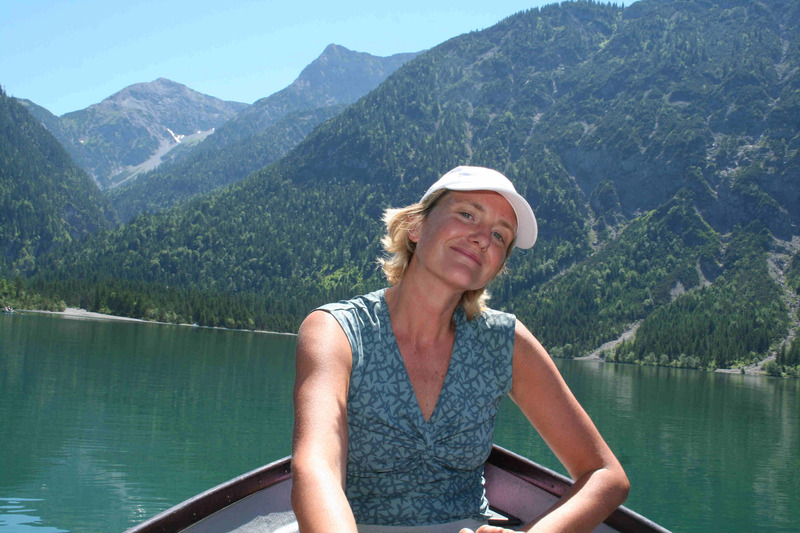 I wonder if my fair-weather friend will be at Füssen July 25th? 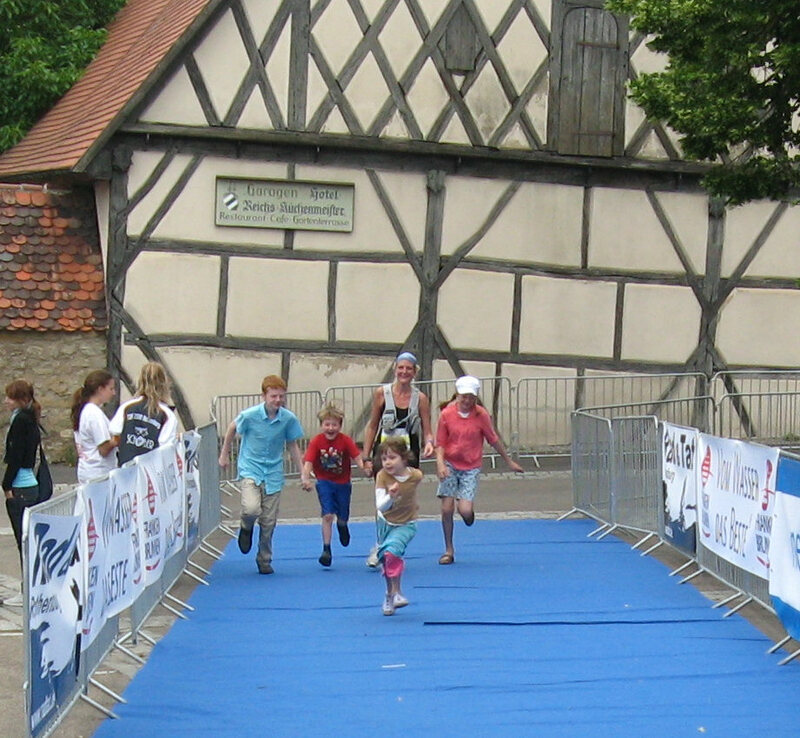 Or if I’ll see her at the Rothenburg Half-marathon June 13th? I’ll bring the sound of her footsteps with me, just in case. Weather: Blah. But the forecast is good. Questions: How do I train while cruising the Rhine River? Is it rude to do hill repeats while touring a castle? Am I really supposed to run fifteen miles the day we drive back? I was two miles into my twelve-mile run when a duck flopped out from the woods. It rapidly waddled along the trail, trying to escape the daunting footfalls of the intrepid marathoner. The duck quacked, flapped its wings, and rose a few inches before hitting the pavement. It complained loudly and hobbled down the path, as quickly as its webbed feet and odd body would allow. If this were a story of fiction I would say, as I drew near, the duck suddenly launched itself into the air, soared above the river, and led a column of its compadres to the safety of the nesting ground. I would then tell you the duck inspired me to keep moving, no matter how inelegant I felt. But this is not fiction. The duck flopped back into the bushes. I heard a splash and a lot more quacking. I had ten miles left to contemplate this message from nature. The literal interpretation suggested I was a creature out of her element: waddling along looking ridiculous, while the real runners passed by. If the interpretation hinged on flying, then it meant I would be unsuccessful in my attempt to soar. Nature was telling me to fling myself through the bushes and plunge into the easy stream of my pre-running life. Or maybe, just maybe, I was reading too much into things. Sometimes, ducks just fall into your path. I read messages in nature: they are the Creator’s sticky notes, attached to the massive calendar of my life. Some notes challenge me, in order that I might grow. Other messages encourage me to press on, to stay the course. At mile nine, I saw the swan. Family and training neglect: low. Miles: last week 26. Monday 5. Total Miles (since training began): 222. Weather: Last Tuesday I did the treadmill, and subsequently vowed to do the treadmill only if tornadoes were actively ripping up my running paths. Otherwise, I had good weather. Saturday was gorgeous (though a little too hot), and today is also sunny and in the 60s. Something New: I began doing pace training. 200 meters fast, 200 slow, 400 fast, 400 slow, etc. I did that for the first two miles of my four mile run, and while I thought I had slowed down for the last half of the run, I was actually running faster than ever. I ended up averaging a 9:16 mile (on the roller-coaster route), which is a personal best. Aches & Pains: I was fairly rubbery-legged after the 12 miles. I discovered muscles I never knew existed. Also, my fingers swelled up like sausages after my long run. I quickly pried off my wedding ring. The swelling was most likely from the way my water pack had been pressing on my shoulders. Nothing serious—just weird. 1 bottle of wine shared between 2 friends over 5 hours does not a hangover make. Rather, it was staying up until an hour I’d not seen since the last baby was weaned, which made me a little less than sporty for my eight-mile run. I couldn’t help myself. Not only were my brother and mother here, but so were two friends. One was a new friend, but the other knew me when I was still feathering my bangs. When everyone else retired, my dear friend and I stayed up, talking until the candles burned themselves down to nubs. Hospitality and marathon training can live in harmony. Sunday morning found me on my scheduled run, with my brother, who had skipped the high school girl giggle fest, biking beside me. Even with nearly half a liter of wine in my system, and only 4 hours of sleep, I could still keep under a ten-minute mile. The delightfully flat trail by the river Main (pronounced “mine”) helped immensely. Marathon training is entirely doable when you have company. In fact, training is better when someone you love is riding a bike or running with you. I was blessed with good running weather while my brother was here, and he was able to see firsthand my tangled maze of running trails. Together, we happened upon an idyllic trail, which ran for miles along the river Main. While the path along the Main will be a perfect place for my weekly long run, I can never see it again without being reminded of my brother, and the five thousand miles that lie between us. From this point on, the river trail will be a place where joy and sadness are forged into kinetic energy. Stats: I am proud to report I have not slacked off during training. I didn’t do the half-marathon, but I can catch the next one. Miles: May 3rd-May 9th a weekly total of 21 miles. May 10th-May 16th a weekly total of 21 miles.